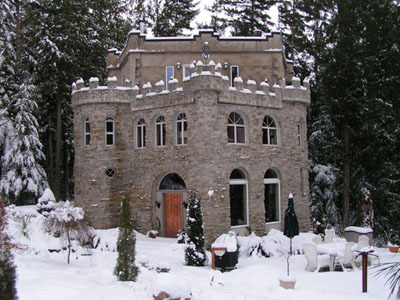 Jim I bought this Castle in 1995. I bought it from an individual who had spent 5 years building 2 floors. It had no power, no water, and no interior walls or rooms. It has taken me a long time but it is a showplace today, and it is a residence I dearly love. It is located in the Skagit Valley, Washington State. This property is one of a kind, it has a bridge to the front door over a 150' deep ravine, and it sits on 20 forested acres. Below the Castle is a 25 foot waterfall. I'm a resident of Washington state who just found your lovely website. In my quest to build my own perfect castle, I wanted to see other local castles in the area and found your site very fulfilling. 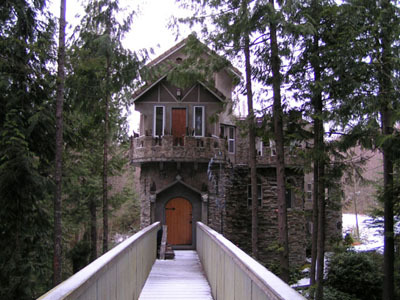 I found the pictures of the Skagit castle intriguing. It is located in the town of Sedro Wooley, Washington, which is located in the Skagit Valley. It has 3 bedrooms, 1 3/4 bathrooms, 2 fireplaces. it is 2972 sq ft on 20 acres. Includes wood heated hot tub, indoor sauna, htd/jttd tub, alarm system,wine room,granite,viking appliances,fully furnished home option & more. Approved permit for 3-car garage,grt timber value, elk run & backs up to greenbelt on N&W sides. Own your own party of nature! A special thanks to Mr. Martin for sending the photos.